death was officially attributed to exposure to Agent Orange. Real was a native of Canton, Ohio, the son of Harry A. and Karin McCoy. Early on, he demonstrated natural leadership abilities, both in academics and in athletics. In high school, he was a member of the National Honor Society, the band, and the Choral Society, and was a class officer all four years, culminating with his election as president of the senior class. An outstanding athlete for the Canton McKinley Bulldogs, he lettered in football, basketball, and track. His high jump record endured for more than 20 years, but his real love was football. He carried that love with him when he joined the Corps in the summer of 1946.
special camaraderie. Real McCoy was a B-Squad player, a teammate warmly remembered." was a member of the Cadet Choir all four years, he tried to convince everyone he was Jewish so he could sleep in on Sunday mornings. He did not succeed, but sleeping in on Sundays did became a lifelong goal for Real! After graduation, Real received pilot training at Perrin Air Force Base, Texas, where he met Evelyn, and at Williams Air Force Base, Arizona. 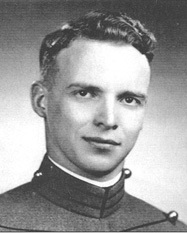 After a tour of duty at Tyndall Air Force Base, Florida, Real attended Purdue University, where he earned an MS in civil engineering in 1956. He served three years as Base Civil Engineer, Burtonwood, England, then attended Command and General Staff School at Fort Leavenworth, Kansas. He became Civil Engineer for the DEW Line and then the BMEWS O&M contracts. During 1963-65, he served as Chief of Flight Operations at Stewart Air Force Base, New York, followed by a tour as Assistant Director, Airlift Control Center, Tan Son Nhut Air Base, Viet Nam. in the midst of a crooked and depraved generation among whom you shine like stars in the sky."